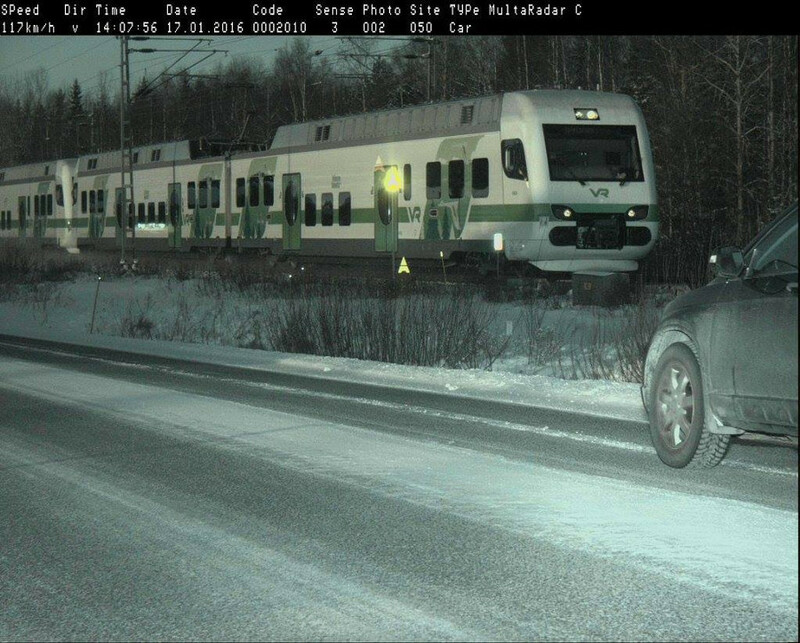 In Helsinki, Finland, the police department on Wednesday released a speed camera photograph of a train in a light-hearted attempt to personalize the city's automated ticketing program. The image, taken on January 17, shows the front end of a car with a fast-moving train in the background. According to the speed camera, the "car" is traveling at 117 km/h (72 MPH), but the police realize the car was not actually traveling that fast on the snow-covered road. View the full camera image. "The speed limits on the road, of course, do not apply to trains," the department explained in the photo caption. Had the car approached a few seconds later, however, its license plate would have been visible in the frame and a citation may have been automatically issued. The train photograph illustrates radar's inherent inability to distinguish the source of a reflection. When a photo radar device is positioned facing, for example, large metal objects, those reflections can generate inaccurate speed readings. The problem is so pervasive that Gerrit van de Kamp, head of the ACP police union in The Netherlands, on Monday called for a moratorium on the use of photo radar. "My colleagues and I are expected to manually filter out faulty flash measurements, but things will slip through," van de Kamp told Algemeen Dagblad. "The result is that drivers can unjustifiably lose their license and therefore possibly lose their jobs... These errors can destroy lives." The issue came to light after Dutch speed cameras accused a large commercial truck of traveling 238 km/h (147 MPH) and a bus of traveling 185 km/h (114 MPH). These errors were only noticed because the vehicles that were charged were equipped with 90 km/h (55 MPH) speed limiters. Van de Kamp suggests there is no way to know whether innocent motorists have been wrongly accused by faulty readings. In the United States, an audit of the speed cameras in Baltimore, Maryland in 2014 found the error rate was as high as 36 percent. A television news program in Ireland used internal emails and whistleblower testimony to show how cameras were improperly set up by operators whose only goal was to issue more tickets. In 2012, a red light camera in Florida accused a woman of driving through the intersection at 215 MPH.